There’s nothing official as yet, but veteran Toronto/Los Angeles/ Ottawa talk show host Bill Carroll appears to be set to replace Evan Solomon on Bell Media’s national radio daily talkfest. He was hosting Friday where Solomon typically takes the day off, since Evan hosts CTV’s Question Period political show on Sundays. However Caroll made no mention of Solomon, and, while acknowledging that this was his first show, he told a caller or two that he would be back throughout the weeks that follow. It’s possible the replacement is only temporary while Solomon takes some vacation time. But to this veteran radio listener it sounded like more than that. 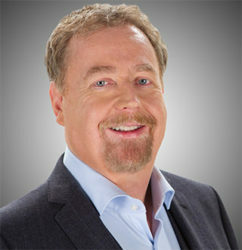 Carroll joined CFRB in 1998 and established himself as an effective talk show host. He went to KFI Los Angeles in 2012, but was still heard afternoons in Toronto on AM640. When he returned to Canada in 2016 he failed to get a longterm commitment from AM 640, so instead became the breakfast-time host at Ottawa’s CFRA where he’s been the past three years. At one point during his tenure in L.A. Carroll was ranked in 5th position on Newsmax’s 50 most influential radio talk hosts. He’s only hosting Fridays. Evan is continuing Monday-Thursday. He didn’t mention Even because he wasn’t filling in for him. As Don said, just Fridays because Evan is busy working on the QP TV show anyway. Show and made a point of listening every day. His topics were very timely and I found he kept his politics to himself which was refreshing. Can Bill fill these shoes? Turns out Don & Andre are correct, and Sue and other Evan fans can relax. On Twitter the ‘Friday only’ Bill Carroll hosting has been confirmed. Not familiar with any of them. Bill Carroll is plain awful. He’s never prepared for the show.